The proliferation of mobile devices and digital data has led to an exponential rise in demand for video streaming among millennials and Generation Z. Opportunities abound for the media and entertainment industry as 5G technology inches closer than ever to real-world implementation. As the global population is withdrawing from cable TV subscriptions, video streaming, online advertising, and personalized content are gaining prominence in 2019. Video-on-demand is dominating the media and entertainment industry, prompting distributors to innovate new ways to bundle and disseminate video content. This, in turn, will help content creators to push the envelope in content creation and monetization. On the tech front, innovations such as AI, machine learning, augmented reality (AR), and virtual reality (VR) are pushing the media and entertainment companies to reinvent viewing experience and improve their revenue with targeted advertisements. This trend is likely to witness significant investments in digital video advertising. AI and analytics, in particular, will help streaming and video companies to better target complex, hyper-segmented markets and provide accurate recommendations. All in all, a massive opportunity for media companies to strengthen their streaming quality, content libraries, and distribution. Nonetheless, content creators and digital advertisers need to rethink their user engagement strategies at a time when data privacy and protection regulations landscape is changing. The introduction of EU’s GDPR legislation, for example, requires companies to seek permission from consumers before accessing their personally identifiable data. To help CIOs navigate through the list of media and entertainment solution providers, our distinguished selection panel, comprising CEOs, CIOs and VCs, industry analysts and the editorial board of CIOReview narrowed down the 20 most promising media and entertainment solution providers 2019 that exhibit competence in online media lifecycle and management. 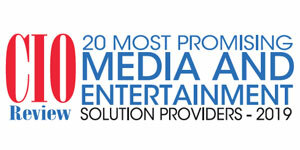 We present to you CIOReview’s 20 Most Promising Media and Entertainment Solution Providers - 2019.